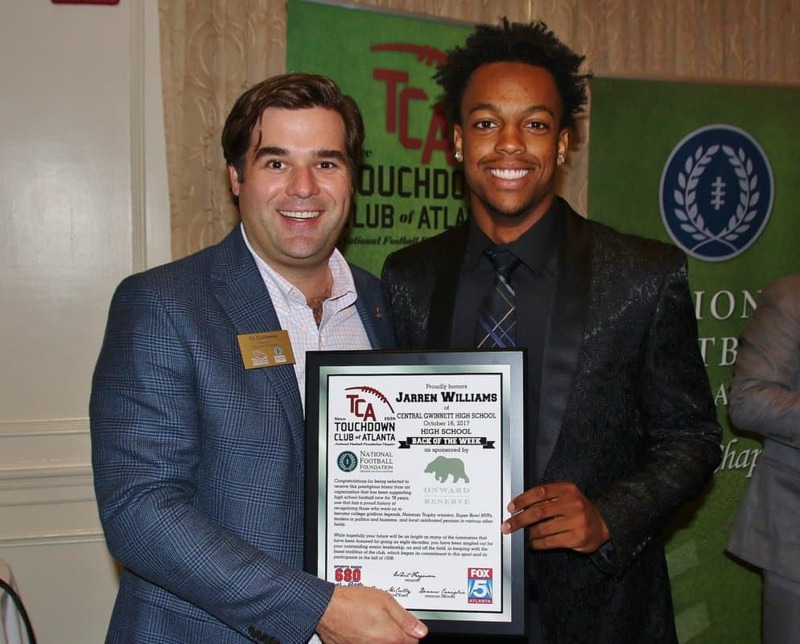 Our Back of the Week from Week 7 is QB Jarren Williams from Central Gwinnett HS. In a big win over Lakeside he compiled 287 yards of total offense (232 passing, 55 rushing) and scored five touchdowns, two rushing and three passing. This was his 2nd 5 TD night of the season. Through just 5 games, he is #2 in the state in passing yards, has 14 TDs passing and has also rushed for 4 more TDS. He is leading Gwinnett County in every statistical QB category. He is a 4star recruit 247 sports with offers from most the SEC. He is committed to play at the University of Kentucky. He was honored last week with a US Army All American jersey which he will be playing in the prestigious game on Jan. 6th 2018.